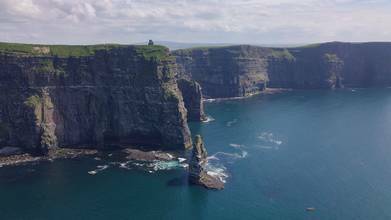 Prepare to be blown away by this amazing aerial video record of an epic trip to Ireland. Here are the locations featured in the video, which was shot with a DJI Mavic Pro drone by contributor Reiniere1: the Cliffs of Moher, the Giant´s Causeways, Powerscourt Garden, the Wild Atlantic Way, Ben Bulben Mountain, the Samuel Beckett Bridge of Dublin, Cahergal Fort, Mcdermott´s Castle, the Dark Hedges, and the Cobh Cathedral. See the Emerald Isle from an entirely new perspective! Description: Me and my girlfriend are Venezuelans living in Ireland, this is our adoptive country and it has welcomed us in a very nice way, we decided to get to know our beautiful new adoptive country, so in 2018 we travel as much as we could to achieve that, so in this video you would see great landmarks of Ireland such as, The cliffs of Moher, The Giant´s Causeways, Powerscourt Garden, The wild Atlantic way, Ben Bulben Mountain, The Samuel Beckett Birdge of Dublin, Cahergal Stone fort, Mcdermott´s Castle, The Dark Hedges, The Cobh Cathedral, and few more, including some snow we had last year, let me know wich one is your favourite Irish landmark. The video was mostly made using a DJI Mavic Pro.